As many of you will know from The Costume Society Facebook page, Glasgow Museums are planning a nineteenth century costume exhibition at Kelvingrove Museum and Art Gallery in 2015. Since October 2013 I have been working as a volunteer with the Curator of European Costume and Textiles, Rebecca Quinton, to select objects for the exhibition. We’ve had a wonderful time going through the clothes, cataloguing, photographing, and choosing based on various themes important to Glasgow, within a wider theme of colour. 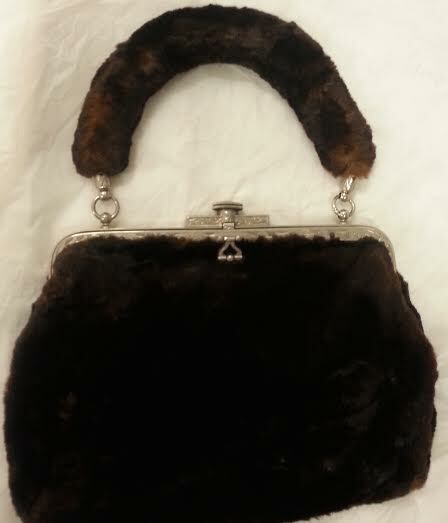 A few weeks ago we decided to delve into accessories - starting with bags. 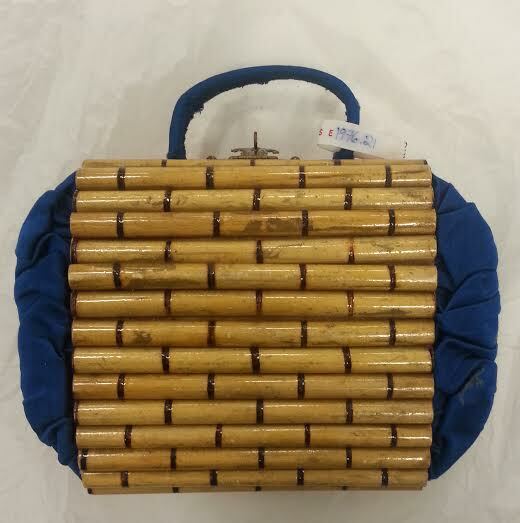 Excited at the prospect, I spent a day at the Glasgow Museums Resource Centre going through boxes and boxes of bags. Small beaded bags, stocking purses, tiny tobacco pouches, sealskin bags, silver-framed chatelaines and myriad other delights, including one divine black box bag stuffed full of receipts for cocktails, hotels, calling cards, and membership to a Cannes casino, dated 1926. But I was stumped - it seemed every bag looked somehow the same. With the exception of the bags that were obviously from the nineteenth century (stocking purses, chatelaines), every bag looked like something I would buy from any vintage shop and take on a night out in 2014. I decided I needed to refine my bag expertise. I started with the V&A and Hampshire Museums websites, looking at as many examples as possible and noting important dates. 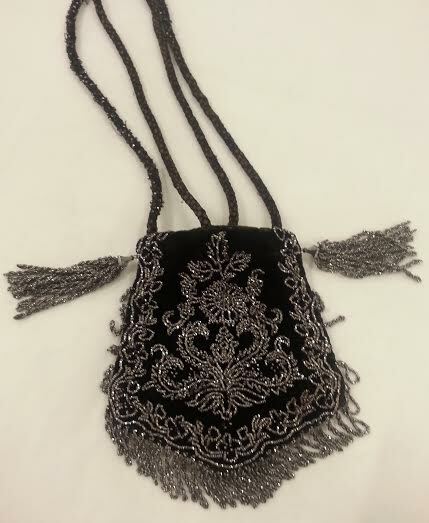 I then moved on to Vanda Foster’s Bags and Purses and Visual History of Costume in the Nineteenth Century, and Christina Walkley’s Dressed to Impress all of which were brimming with useful clues for the fledgling bag detective. A dash of the Cunningtons’ and more notes taken and I was prepared to start again. My second trip to the Resource Centre and looking at the bags with fresh eyes was quite startling. Even those bags from the 1840s look modern; and differentiating between decades depends on the tiniest of details - aniline dyes, for example, were only adapted for leather in the 1870s so any brightly coloured leather could only be from the last quarter of the century. As the nineteenth century progressed, travel became more common, and travel bags required locks; those locks became more elaborate and secure. After much deliberation we eventually selected several bags that are outstanding examples, and that I think visitors to the exhibition will find incredibly interesting. 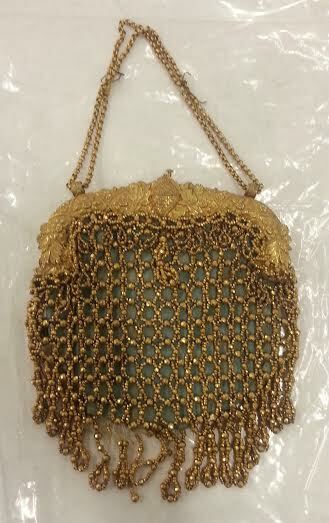 Picture one shows an early nineteenth century beadwork bag of silver gilt (unbelievably weighty), picture two shows a blue silk and bamboo bag with a handwritten inscription inside dated 1846, picture three shows a beaver fur bag from 1894, and picture five shows black velvet reticule worked in steel beads dated 1830. My next trip to the Resource Centre is to select parasols and umbrellas. I’ve already started my research for this one and hope to find some inventive umbrellas (Glasgow isn’t known as Raintown for nothing) so please do check back for my next blog!